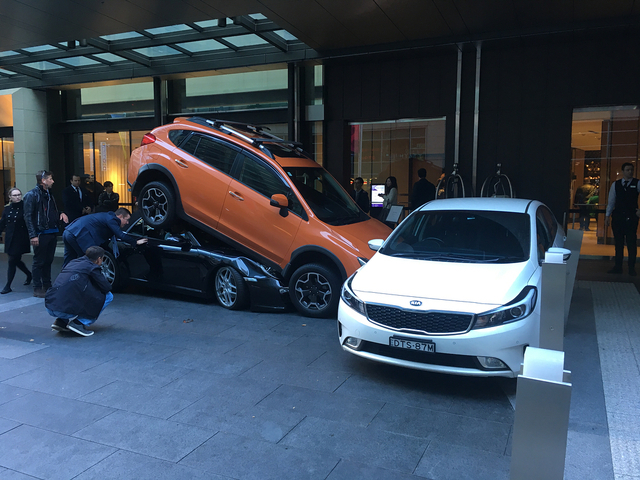 A valet at the Hyatt Regency hotel in Sydney has lost control of the Porsche 911 Carrera convertible he was parking, and wedging it underneath a Subaru XV Crosstrek. The accident happened on Thursday May 30 at around 8.20am during the morning rush hour. “They had to cut part of the car away and pull the staff member out,” Matthew Talbot, the Hyatt Regency’s director of sales and marketing, told ABC News Australia. The male valet was not injured. Hotel management are doing a full investigation into the incident with staff, the cars’ owners, and authorities. “The car ran into the orange car and then wedged itself under it,” Jonathan Bouzaid who took these photos told ABC News Australia.